We Need Your Creativity and Involvement! 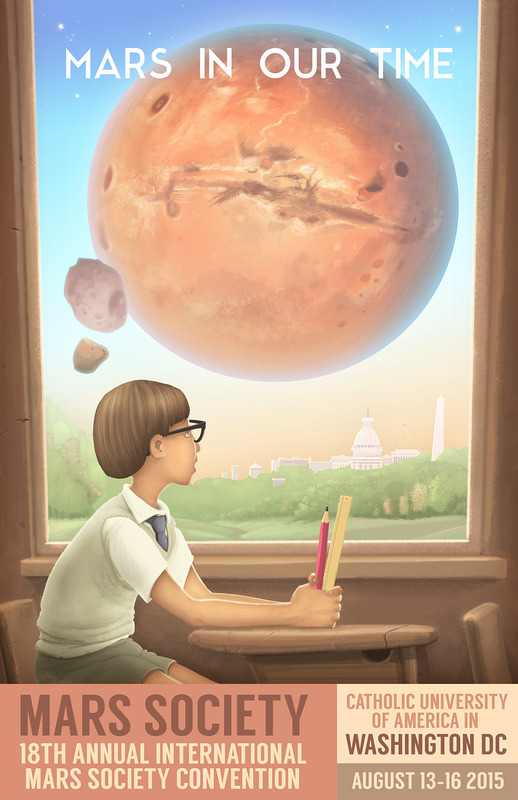 The Mars Society is looking for fun, creative design submissions for its annual poster contest, with the winning entry to be used as the primary promotional graphic for the 19th Annual International Mars Society Convention, scheduled for September 22-25, 2016 at the Catholic University of America in Washington, D.C. When designing a poster, participants are asked to incorporate the main theme of the Mars Society convention into their layout. This year’s theme will be: “Mars: A Mission for the Next Administration, Not the Next Generation.” The deadline for submitting a poster design is Monday, March 7th at 5:00 p.m. MDT. Technical requirements for the contest are as follows: 1) The poster size should be 11" x 17", 2) There are no restrictions with regard to use of color, 3) If your poster is selected, the designer will need to submit a full color poster as well as a gray-scale copy, and 4) Poster designs can be submitted in Photoshop or as a .pdf file (the former is preferred). When submitting a poster design to the Mars Society, please email the sample to: postercontest@marssociety.org. Please also use this email address for any questions related to the contest or the submission process.